The AL-KO Solo Concord BF 5002-R power unit gets a further useful accessory in the form of this CF 500 handy Tiller Attachment. Equipped with four star-shaped tiller blades and a V belt drive system. This tiller is useful for use in light soil conditions. Other attachments in this AL-KO range include a Scythe, Ridging Plough, Sweeper Brush, Snow Plough and Snow Chains. 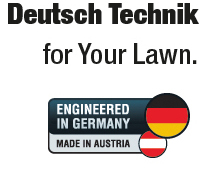 AL-KO has recently acquired Sindelfingen-based SOLO Kleinmotoren GmbH to strengthen its range of garden machinery. The existing AL-KO range is being expanded with petrol chainsaws and trimmers, providing customers with expertise and strong, tradition-rich brands in one product range. Founded in 1931 by Alois Kober as a small metalworking shop in southern Germany, AL-KO has become a global player comprising of more than 50 sites in 30 countries. The AL-KO Group today employs over 4,200 people worldwide covering three business divisions - Vehicle Technology, Garden + Hobby, and Air Technology. All AL-KO employees take great pride in the quality products they manufacture. For more than 50 years, AL-KO has been developing and designing innovative garden tools for an extremely wide range of requirements and applications. Not only do AL-KO tools reflect its many years of expertise in technology and function, they also set new standards in terms of design. With Germany efficiency, AL-KO's research and development engineers create pioneering garden tools from hundreds of individual parts. Materials of the highest quality, ingenious technology, perfect ergonomics and a sure feel for form and deteail make AL-KO's garden tools unmistakable. The rigourous quality requirement that characterises the AL-KO band is guaranteed through its comprehensive technology programme that is consistently planned and implemented by AL-KO development engineers, designers and technicias - from the first design, to prototype construction and the end product. All machines come with a two year warranty, following this machines have an extended warranty depending on the range and annual servicing by an authorised AL-KO dealer.